On their way to sustainability, cities need support to become more resilient to hazards, protect and preserve human life and limit damages to public and private assets, while continuing to provide infrastructure and services, during and after a crisis. Moreover, climate change may make the crisis more severe and/or more frequent with the impact of sea level rise on coastal cities as one example. Raising global awareness and calling to action on the sustainable development of cities worldwide, is what the UN’s World Cities Day is all about. 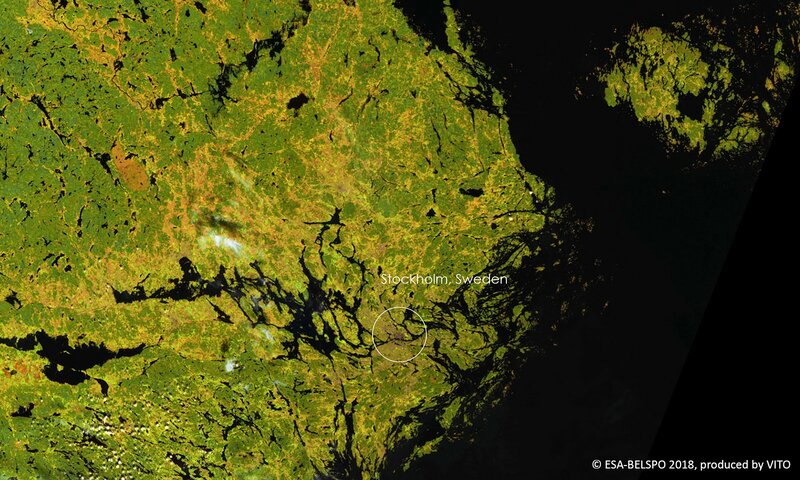 On the occasion of the 2018 edition, on October 31, PROBA-V shares an image of Stockholm, Sweden’s capital city (in grey tones, between Lake Malar and the coastline). Stockholm is the third most sustainable city, according to an exhaustive study of 2016 that ranked 100 of the world’s top cities.